I was asked yesterday if I could work on some sort of comparison between Blackboard, Moodle, and web 2.0 for college classes. I’ve got it. They’re like Lego*. Blackboard is like the Lego kits you get, the ones that make something in particular using exactly the parts inside the box. You can, of course, make other things out of the pieces, but you have to ignore the instructions and exercise a bit of creativity. 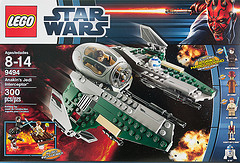 Of course, most people buy the Lego kit in the first place because they want to make exactly what’s shown on the picture on the box. So Blackboard gives you all the pieces as a set collection, with a map of what you should make: course menu buttons for each type of content, places to upload and make announcements, etc. You can make changes (put the propeller on the building – or change the course menu button to say “Week 1”), but you have to consciously break away from the plan. It’s not dangerous, but it can be scary. Instructure Canvas is a smaller kit, but it’s still a kit. Pearson’s LMS is like a kit too, as are the many others being produced by publishers and other ventures. 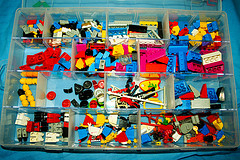 Moodle is like the boxes of Lego you get with a certain number of each kind of block. There is no real set plan, except that you can only use as many bricks are in the box, unless you go buy more. There are only a certain number of single-peg bricks, only a certain number of blue. You can build whatever you want, but it’s limited by the number of bricks you have of each size and colour. So Moodle gives you a page where you can add a schedule like a syllabus or topics in the center column, and blocks (yes, blocks) on the sides with small apps or information. You put in only what you want – no need to toss propellers aside looking for something else. There are limitations but the map is more flexible. 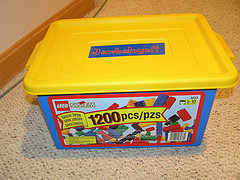 Web 2.0 is like buying a bunch of Lego at a garage sale. You don’t know what you’ll get to start with, but it’ll be fun discovering what’s in there and figuring out how to use it. You imagine as you build and try different things. Sometimes you think two pieces don’t go together, and they do. Since you don’t know what’s there as you look into the box, you are open to possibilities. You plan ahead mostly to make sure you don’t run out of the bricks you might want to use, and you can always go to another garage sale and get more. So using Web 2.0 elements to create a class is about exploring, picking and choosing, experimenting and seeing what works. You have to be more adventurous, more open, more flexible in the face of change. And what you end up with may be surprising or unexpected, but it will always be interesting. (* I will not offend my English friend Ed Webb by using the American vernacular for the plural: “Legos”). Aha! The weakness of my analogy is exposed – thank you. Yes indeed, none of the boxes of Lego truly belong to us. They are all, in one way or another, rented. A nice metaphore indeed, but as a fervent Moodle user I don’t quite understand what you mean if you say “a certain number of each kind of block”. In Moodle you can put in as many forums or wikis in your course as you like. There’s no limitation. Also there are so many plugins and extra modules designed and made available by the community, that everything you nedd is somewhere to be found. With regards to stability and trustworthyness in the long term: Moodle is alive and kicking for almost ten years now and it had no business model that will stop your rent period. Still, there are only certain kinds of blocks in Moodle – wiki, forum, feedback, etc. Many kinds, but they are limited. Web 2.0 would also include elements such as this adapter kit – http://fffff.at/free-universal-construction-kit – which allows your LEGO to interact with other types of building blocks. I like comparing Bb to jarred spaghetti sauce. It is fine if you are in a hurry, but you might want to add some spices to make it better or your own. Creating your own online component is like making the sauce from scratch. While making the sauce from scratch can be definitely better, making it for the first time can be intimidating, time-consuming and awful initially. After the first few times making sauce from scratch becomes easier and jarred sauces do not seem like a great option. My son just got the Star Wars lego kit you use to exemplify BlackBoard today, he will be crushed when he learns he has to return it first thing in the morning.